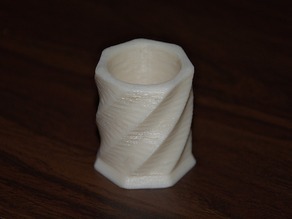 Printed in ABS at .01mm resolution, 45mm/sec, 15% infill, and 105% flow rate on a Formbot T-Rex 2. I used a skirt, but no brim or raft. Infill doesn't seem to matter much. Almost the whole model is perimeter.